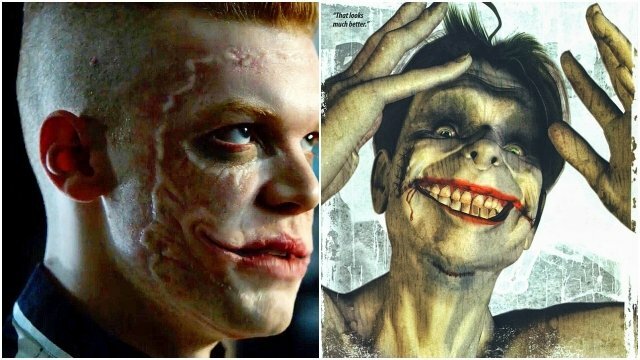 Earlier this week, many fans of Gotham were taken aback upon learning that, according to both David Mazouz and Cameron Monaghan, Jerome Valeska is NOT the man who’ll be revealed to be the Joker. Really, despite all the stars that have thus far been aligned and a Joker card being proudly displayed in the trailer for the midseason premiere, we’re told that it’s simply not meant to be. For the lapsed and uninitiated, the reason that we were so disappointed to learn of this is two-fold: Not only has Monaghan delivered what have been arguably the most accurate comics-to-screen performances as the Joker (or somebody like him), but he recently adopted some looks that were homages to Death of the Family and Endgame, a couple of modern Batman classics crafted by Scott Snyder and Greg Capullo. So, until the midseason premiere actually airs, we’re just going to have to wait to see how it all pans out, but in the meantime, people are already voicing their concern over the Joker being a copycat. Really, it’s completely out of character, as he’d never follow another person’s lead. But being somebody who understands the villain better than most, I’m fairly confident that I’ve been able to infer where the producers may be going with this. Thanks in part to some cryptic Tweets made by Monaghan himself that we’ve taken screenshots of (check out the accompanying gallery) just in case he’s forced to pull them down, I’ve been able to formulate a pretty solid hypothesis, so please hear me out. Originally published in the pages of Batman #663 before later being collected into the Batman and Son trade paperback, this prose-style tale penned by the incomparable Grant Morrison saw the Joker “birth” a new personality as it were. Now, don’t confuse that with multiple personalities, but I’m going to do my best to streamline this explanation because Morrison is know for his complexity. Basically, the legendary scribe acknowledged that every version of the Joker that’d come before was the same guy, but he went through some changes: There was the ruthless killer of 1940, the wacky clown we saw in the ’50s and ’60s, and the lunatic we’ve come to know from the ’70s and on. But in this story, a darker, more dangerous personality emerged. In what appeared to be a most painful process, this “new” Joker overwrote the previous personality, and I’d even been given the impression that his voice had changed. And in keeping with that, I’m forced to wonder if Gotham‘s Joker will, in fact, still be played by Cameron Monaghan, but it just won’t be Jerome, if you will – it’s a personality that’ll overwrite him. So, whether you’re familiar with the information I’ve presented or not, feel free to go back and compare it to Monaghan’s Tweets and form your own judgment. Again, we’re not going to have concrete answers for a few more months, but we’re interested to hear what’s on your mind, so be sure to sound off in the comments section below.